Tree removal is done through precise and calculated efforts by the professionals at Tree Works. The process of tree removal can depend largely on the size, location and type of tree. There are more than 800 different species of trees in the United States, which requires different means of removal. At Tree Works, we utilize the most efficient means of removing a tree from your property. Basic tree removal service is offered in which we remove the tree and its limbs while cutting the larger parts into firewood. We can also haul those extra pieces as well. We can take down a tree all at once, or in numerous pieces at a time. A lot will depend upon the setup, proximity to property and potential hazards. There is also the option of removing pieces one by one and lowering them individually. This is typically for larger trees and removal may require a crane. When removing a tree, it is important to know what kind of tree you are dealing with. For example, pine trees are popular in the state of North Carolina, but they have very shallow roots. Most of the roots of pine trees are embedded into just three feet of ground. That means that diseased or sick pine trees could be the first to fall in the midst of high winds. Magnolia trees have long and thick roots, which can be almost four times as long as its branches. Meanwhile, oak trees can live hundreds of years but once oak rot or fungus get into the roots, they can become hazardous. Removal options may differ for magnolia and oak trees. In most instances, tree removal leaves the stump in the ground, although this will be done so that it does not sit very high off the ground. 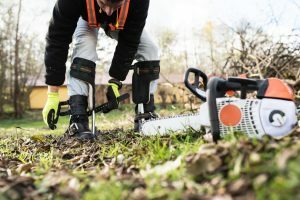 In instances when stump removal or stump grinding is requested, Tree Works can attend to that function as well. Our professionals can quote you an affordable price and we always consider the safety of your home when conducting our tree removal service in Charlotte, NC. Contact Us Today To See How We Can Help Your Home Or Business!